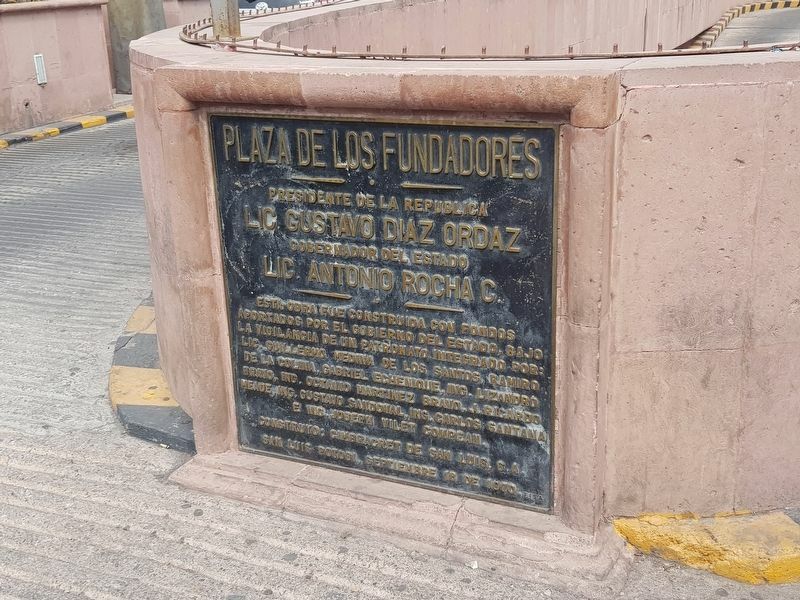 Esta plaza se llama así en honor a los fundadores de San Luis Potosí: Fray Diego de la Magdalena, Juan de Oñate y el Capitán Miguel Caldera, que fueron quienes congregaron en este sitio, de manera oficial, a los primeros habitantes de esta ciudad. Esta plaza ha tenido varios cambios. Durante el periodo novohispano formaba parte del atrio del Templo Jesuita de la Compañia. En el porfiriato fue el bello jardín arbolado Arista. 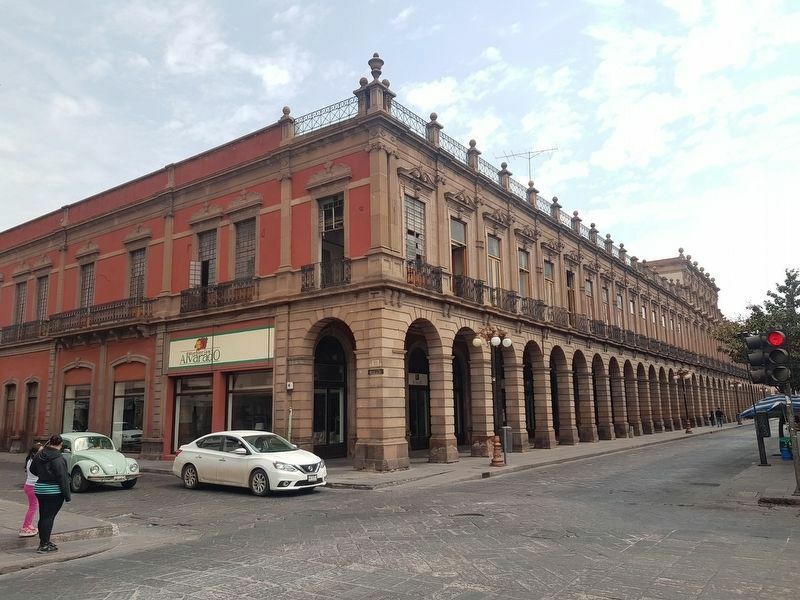 En 1966 se demolió una manzana para ampliar la plaza e integrar visualmente los edificios que la conforman: el edificio central de la Universidad Autónoma de San Luis Potosí (antiguo Colegio de los Jesuitas), el Templo de la Compañia, la Capilla de Loreto, y el edificio Ipiña. Esto también permitió conformar una plaza para dar cabida a eventos cívicos, multitudinarios y conciertos. 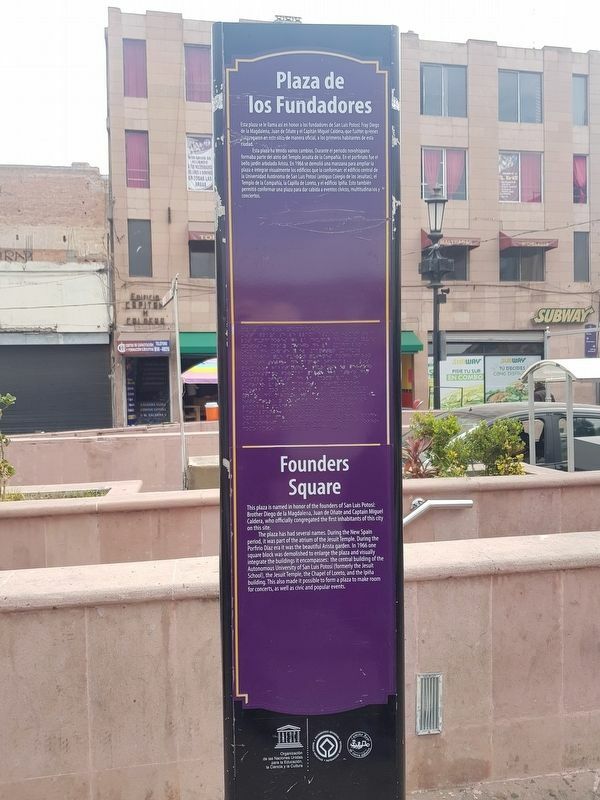 This plaza is named in honor of the founders of San Luis Potosí: Brother Diego de la Magdalena, Juan de Oñate and Captain Miguel Caldera, who officially congregated the first inhabitants of this city on this site. The marker can be seen here in profile to the right. In the distance is the Chapel of Loreto and Autonomous Universidad, both mentioned in the marker text. has had several names. During the New Spain period, it was part of the atrium of the Jesuit Temple. During the Porfirio Díaz era it was the beautiful Arista garden. 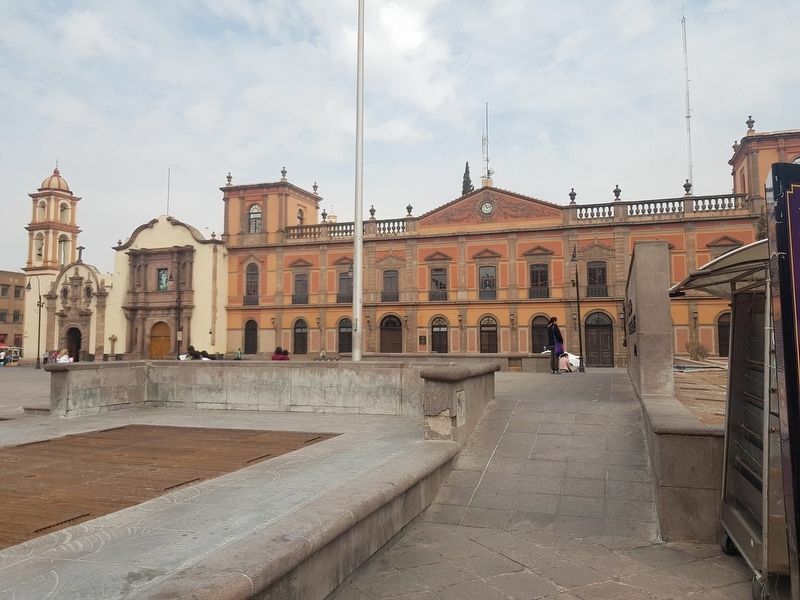 In 1966 one square block was demolished to enlarge the plaza and visually integrate the buildings it encompasses: the central building of the Autonomous University of San Luis Potosí (formerly the Jesuit School), the Jesuit Temple, the Chapel of Loreto, and the Ipiña building. This also made it possible to form a plaza to make room for concerts, as well as civic and popular events. Location. 22° 9.125′ N, 100° 58.667′ W. Marker is in San Luis Potosí, San Luis Potosí, in Municipality of San Luis Potosí. Marker is on Avenida Venustiano Carranza just west of Lic. José Ildefonso Díaz de León, on the left when traveling east. Touch for map. Marker is in this post office area: San Luis Potosí 78000, Mexico. Touch for directions. This building is also mentioned in the marker text. 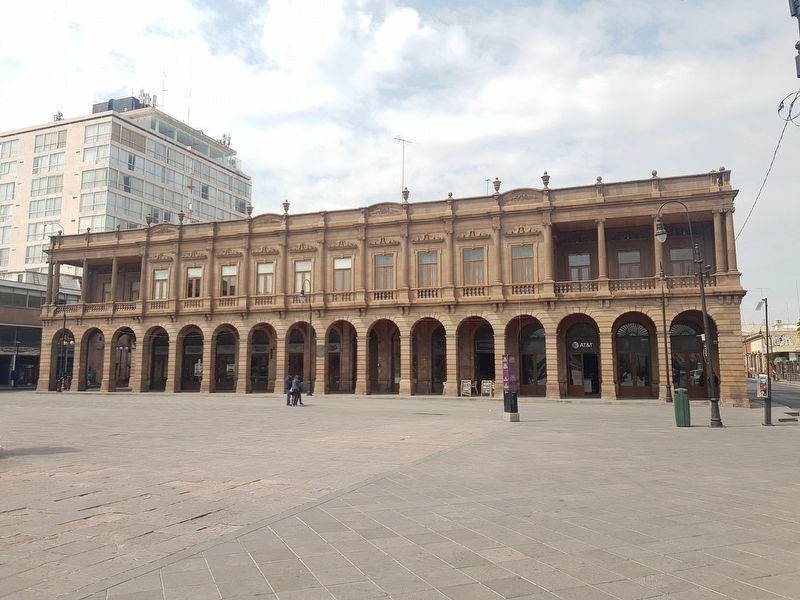 (about 120 meters away, measured in a direct line); Government Palace / Vicereine’s House (about 120 meters away); The Plan of San Luis (about 120 meters away); Nineteenth Century Building (about 120 meters away); The House of the Vicereine (about 120 meters away). Touch for a list and map of all markers in San Luis Potosí. 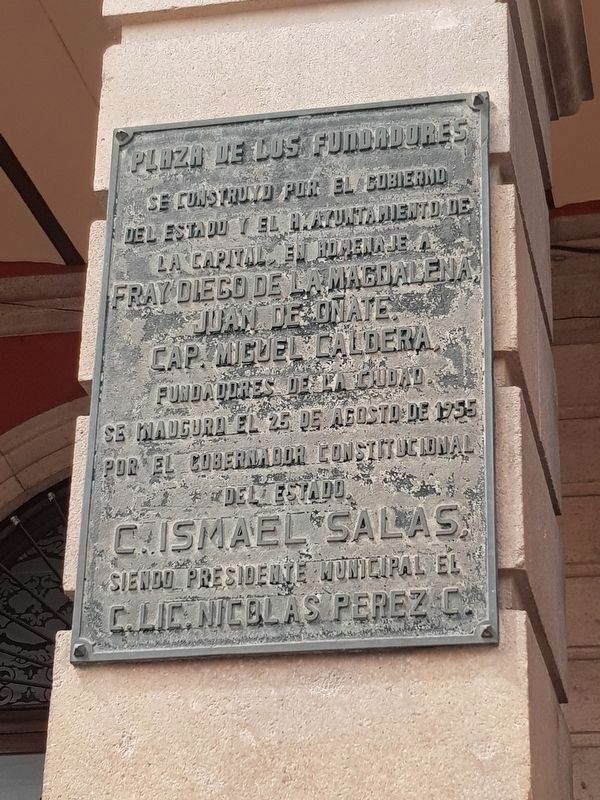 Se construyo por el Gobierno del Estado y el H. Ayuntamiento de la Capital, en homenaje a Fray Diego de la Magdalena, Juan de Oñate, Cap. Miguel Caldera, fundadores de la ciudad. Se inauguro el 25 de agosto de 1955 por el Gobernador Constitucional del Estado C. Ismael Salas, siendo Presidente Municipal el C. Lic. Nicolas Perez C.
The Ipiña Building takes up almost and entire city block. This view shows its southern facade extending towards the Founders Square. More. Search the internet for Founders Square. Credits. This page was last revised on April 16, 2019. This page originally submitted on April 16, 2019, by J. Makali Bruton of Querétaro, Mexico. This page has been viewed 36 times since then. 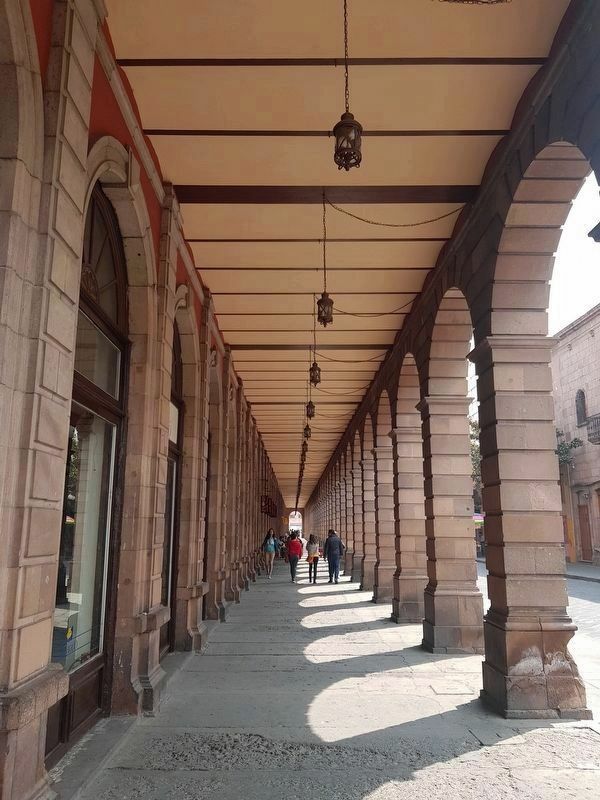 Photos: 1, 2, 3, 4, 5, 6, 7. submitted on April 16, 2019, by J. Makali Bruton of Querétaro, Mexico.